The StableComfort™ system is designed to be a horse friendly surface. The resilient yet forgiving surface closely mimics natural pasture. Horses stabled on this mattress system are more likely to lie-down. Hock sores in recumbent horses are greatly reduced. The one piece top cover makes stall cleaning a breeze. StableComfort™ is a wall-to-wall waterproof stall mattress system. Not only is it ergonomic, efficient and economical, but it is also environmentally friendly. StableComfort™ reproduces the characteristics of natural pasture, providing a comfortable surface for your horse to rest on. This wall-to-wall water-proof stall flooring system allows horses the confidence to walk, rise and lay down without fear of slipping. The StableComfort™ stall mat system is comprised of two components: A multi-celled mattress filled with uniform sized rubber crumbs. 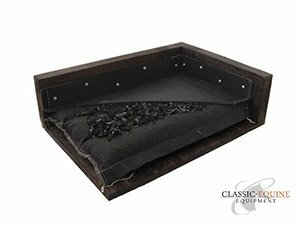 These rubber crumbs provide the mattress with a very high level of horse comfort and shock absorbency. The top cover. 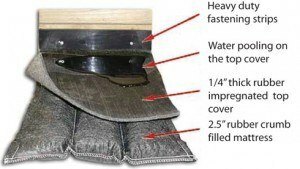 This top cover is made of an industrial-strength geotextile and impregnated with a vulcanized rubber compound that not only adds to its indestructible durability, but makes it a nondraining, water proof stall mat system. Installation begins by placing the 4’ x 6’ crumb-filled mattress in the stall. Extra crumb is placed on top of the mattresses to fill any gaps. The one-piece top cover is fastened to the stall walls using plastic fastening strips and screws. This ensures that no bedding or waste gets underneath the stall mat system. Due to the amount of comfort provided by the mattress system, shavings need only be used for absorption of urine. Muck-out time is greatly reduced and coupled with the savings in bedding costs, this product will actually pay for itself.